Just a short post before I head to work. While talking about Sci-Fi that Anjel hasn’t seen she then mentioned that she has not seen a single Star Trek Movie… Or Star Wars!! OMFG what have I done – I have married a Sci-Fi Virgin!!! Thinking of the good parts of this… and it did take awhile for my brain to recover from the shock… I get to watch all these films again while educating Anjel… And that we have started. Last night we went for Star Trek – The Motion Picture, some say the worst in the franchise I say it is probably the least understood and understandably so… Kinda like 2001 without Hal… Anjel was, I think a little unimpressed, However we followed that up with Star Trek II – The Wrath of Khan – and we got Khhhhaaaaaaaannnnnn! and where impressed! 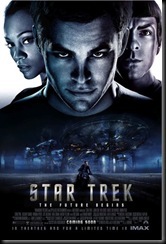 This is such a TRUE Star Trek movie.